There’s only one round of Premiership Rugby left before the competition breaks until November, and Josh Bartholomew is, as ever, here to run you through the talking points from the weekend so far. Granted, they’ve had some difficult fixtures to start their season, but Newcastle’s points tally at this stage is both worrying and disappointing. The Falcons lie in 11th, and their trip to Sale next week looks vital. Despite their early travails, there have been some very encouraging signs for Newcastle, even in defeat. They pushed Saracens, Exeter and Wasps to the end, and Dean Richards must look for the positives as his team head into European top-tier rugby for the first time since the 2002-03 season. Wasps are starting to develop the winning edge that all good teams have, and with Lima Sopoaga steering the ship from fly-half they continue to heap the pressure on Saracens and Exeter five rounds into their Premiership campaign. 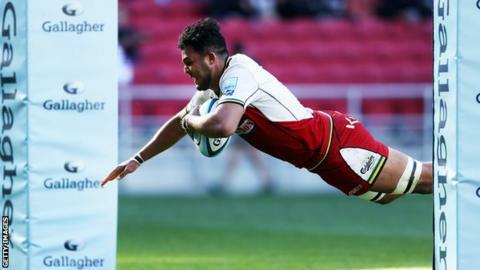 In similar fashion to Newcastle, Northampton have impressed in the opening rounds without gaining the victories that their performances have warranted. This all changed at Ashton Gate today, as Chris Boyd’s side romped to a 45-40 win. The benefits of it are clear – few who were at Ashton Gate today for the try-fest will not return, and Bristol look to have enough attacking flair to be effective in their delivery. Northampton have showed numerous layers to their game so far this season, and a five point victory today is just reward for a promising opening to Chris Boyd’s tenure. Despite their bonus point win over Worcester, Exeter’s victorious performance was interestingly sloppy (by their mountainous standards, it must be said). The Chiefs scored only once after half-time, allowing their opponents to dream of consecutive away wins. Next week Solomons’ side host Bristol in an absolutely crucial game at Sixways, and Worcester will be hoping to progress up the table and eliminate the threat of relegation far earlier than in previous seasons. 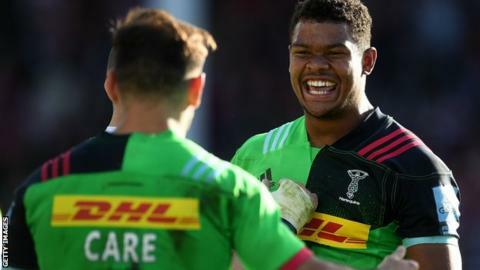 After losing to Bristol last week, Harlequins were quite rightly greeted by a barrage of critics who suggested that Paul Gustard’s revolution was at risk of being halted by relegation. One victory doesn’t change this – in an incredibly competitive Premiership season, it’s likely that the relegated team will have more points than ever before – but winning away at Gloucester is no mean feat, and the rest of the league will be taking note of Quins’ credentials. Gloucester have declined perilously in the last few weeks, and while some still think that the Cherry and Whites will contend for a play-off place, good teams seldom lose two in a row. A successful squad simply cannot afford to lose to sides of Harlequins’ standard in front of their own fans. Todd Blackadder opted to make 13 changes to his starting team for Bath’s visit to Saracens, prompting accusations of ‘throwing’ the game. In truth, it wouldn’t have made a difference had Blackadder picked his strongest side, as Saracens were sumptuous in victory. The Champions have an All Blacks-esque ability to pull away from their opponents in the closing stages, and few will be able to cope with the North-London outfit if they continue to play with such an impressive combination of skill and physicality. Bath lie in sixth, which is a fairly impressive return for a side whose aim this season will surely be to finish in the European places.